X2 1gb sticks included in this lot. 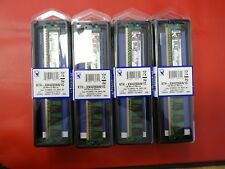 16 X 1GB 16GB Kingston 1GB RAM PC2-4200 NEW SEALED 382510-001. P/N KTH-XW4200AN/1G. We are able to source hard to find parts for Legacy systems through to the latest new in box parts for the latest generations of servers & storage systems. 172-PIN DDR2 MICRODIMM. 144-PIN SDRAM MICRODIMM. 172-PIN DDR MICRODIMM. 214-PIN DDR2 MICRODIMM. CAS LATENCY:CL4 SPEED:PC2-4200 (533MHz). 200-PIN DDR2 SODIMM. 240-PIN DDR2 DIMM. 240-PIN DDR2 OVERCLOCK KIT. New listing2 KINGSTON KTD-INSP6000A/10 (1GB DDR2 PC2-4200 533MHz SODIMM 200-pin) DRAM - V.
1GB DDR2 PC2-4200. 200-pin DRAM. 2 / Matched Pair. KINGSTON RAM. KINGSTON REFKTH-XW4200 AN/1G. 4 STICKS OF 1GB. 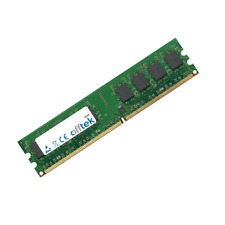 Desktop Non-ECC DDR2 Unbuffered Memory Modules Various Brands/Speeds/Capacities. AJ 111473-4, 111474-4 (I/B 111467). 10 BULK LOT INTEGRAL 1GB DDR2 533MHz PC2- 4200 RAM - IN2T1GNVNDX COMPUTER DESKTOP PC RAM. 168-PIN SDRAM ECC REG DIMM. 184-PIN DDR ECC DIMM KIT. 184-PIN DDR ECC REG DIMM KIT. 240-PIN DDR2 ECC DIMM KIT. 240-PIN DDR2 ECC REG DIMM KIT. 168-PIN SDRAM DIMM. 240-PIN DDR2 DIMM. 184-PIN DDR DIMM. 172-PIN DDR2 MICRODIMM. 240-PIN DDR2 ECC DIMM KIT. 168-PIN SDRAM ECC REG DIMM. 240-PIN DDR2 ECC REG DIMM KIT. 240-PIN DDR2 ECC FBDIMM KIT. 184-PIN DDR ECC DIMM KIT. CAS LATENCY:CL4 SPEED:PC2-4200 (533MHz). Alternatively, complete repurposed modules may be sourced. A Hypertec Legacy MSI Equivalent 1GB DIMM (PC2-4200) from Hypertec. Audio Visual. we do not take any responsibilty after this. Monitor & TV. Alternatively, complete repurposed modules may be sourced. A Hypertec Legacy Asus equivalent 1GB DIMM (PC2-4200). Audio Visual. we do not take any responsibilty after this. Monitor & TV. Component for PC/server. Low profile 1GB DDR2 DIMMs made for Dell SX280. Ensure compatibility with your device before purchasing. Mainland UK. (This is a pair of 1 GB, PC2-4200 (DDR2-533), DDR2 SDRAM, 533 MHz, SO DIMM 200-pin) RAM Modules. 240-PIN DDR2 ECC FBDIMM KIT. 172-PIN DDR2 MICRODIMM. 240-PIN DDR2 ECC DIMM KIT. 168-PIN SDRAM ECC REG DIMM. 240-PIN DDR2 ECC REG DIMM KIT. CAS LATENCY:CL4 SPEED:PC2-4200 (533MHz). 184-PIN DDR ECC DIMM KIT. 1GB Micron MT8HTF12864AY-53EE1 Non-ECC 667MHz PC2-4200U 240-Pin Desktop Memory. 172-PIN DDR2 MICRODIMM. 240-PIN DDR2 ECC DIMM KIT. 168-PIN SDRAM ECC REG DIMM. 240-PIN DDR2 ECC REG DIMM KIT. 240-PIN DDR2 ECC FBDIMM KIT. CAS LATENCY:CL4 SPEED:PC2-4200 (533MHz). 184-PIN DDR ECC DIMM KIT. 2 x SAMSUNG M378T2953EZ3-CE6 1GB 2Rx8 DDR2 PC2-5300U-555-12-E3. 1GB per board Total of 2GB. Alternatively, complete repurposed modules may be sourced. A Hypertec Legacy Apple equivalent 1GB SODIMM (PC2-4200) from Hypertec. Audio Visual. we do not take any responsibilty after this. Monitor & TV. 168-PIN SDRAM DIMM. 240-PIN DDR2 DIMM. 168-PIN SDRAM ECC REG DIMM. 184-PIN DDR DIMM. 240-PIN DDR2 ECC DIMM KIT. 184-PIN DDR ECC DIMM KIT. 184-PIN DDR ECC REG DIMM KIT. 240-PIN DDR2 ECC REG DIMM KIT. 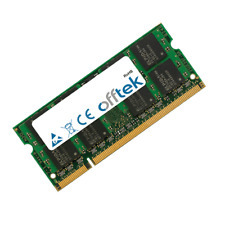 Samsung M378T2953EZ3-CD5 1 GB DDR2 DIMM. Condition is Used. Dispatched with Royal Mail 2nd Class Signed For. This success has been built on a number of core principles :-. OFFTEK Part Number :- FT128MSQ64V5J. Capacity :- 1GB Module. A huge database of information allows us to provide upgrades for almost any computer. Alternatively, complete repurposed modules may be sourced. A Hypertec Legacy NEC equivalent 1GB DIMM (PC2-4200 ECC) from Hypertec. Audio Visual. we do not take any responsibilty after this. Monitor & TV. Brand New sealed boxed Kingston 1GB Memory KTD-DM8400A/1G DIMM 240-pin - DDR 2 - 533 MHz / PC2-4200 Bought but never used item is priced to sell No refunds so please read description and ask as many questions as required. No international shipping UK only. Good luck. 172-PIN DDR2 MICRODIMM. CAS LATENCY:CL4 SPEED:PC2-4200 (533MHz). 200-PIN DDR2 SODIMM. 214-PIN DDR2 MICRODIMM. 240-PIN DDR2 DIMM. 240-PIN DDR2 OVERCLOCK KIT. 240-PIN DDR2 ECC DIMM KIT. 240-PIN DDR2 ECC REG DIMM KIT. MICRON MT16HTF12864AY-53EB1 1GB DDR2 533 CL4 USED. Kingston 1GB SO-DIMM 533 MHz DDR2 SDRAM Memory KTD-INSP6000A/1G for Laptop NEW !